It's My Birthday! (It's liptonrm’s birthday too, she's my birthday twin and my bff, but she has abandoned Livejournal for different pastures - I think she’s still on Dreamwidth a bit, and Tumblr, ofc). We were at Motor City Comic Con all weekend and then I had PT on Monday, so today I just stayed in bed in my pjs all day and played on my iPad. The best present I got was that Kirk came and crawled into bed with me and allowed me to hold his hand and cuddle while I took a nap. He rarely does that! Then my sister brought me home Red Lobster. I would kill a man to get at their stuffed mushrooms, I swear. Anyways, as has become customary for my birthday, I have a baby pic of myself, being oh-so-cute. 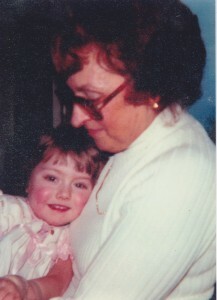 Here is a photo of me at about 4, with my Grandma Ava, the one who passed away last year. Look at me cuddle her! I don’t think we look very much alike at all, but that’s okay, we were both still cuties. 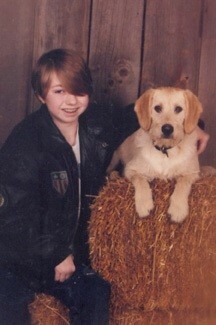 And have a teenage pic as well, me being still cute but also a little awkward. I was a freshman in high school here, so about 14, and I had dropped out to home-school by this point and my mother lamented that I didn’t have any school photos that year because of the home-schooling, so somehow - I have NO idea how - she convinced my dad to pay for professional photos from a studio. I said I would only do it if my dog, Tate, could be in them with me. I was very self conscious at this age and Tate, I think, helped the shots come out good, in the end. 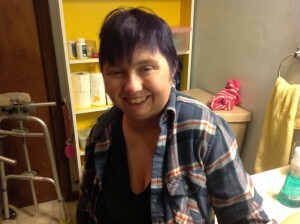 And a grownup pic as well, here I am last year when I dyed my hair purple! Thank you for all the birthday wishes I have received! You guys are the best! ADORABLE pics! I'm so glad you had a fun birthday.